Steven Naismith says Scotland should forget about moving to BT Murrayfield - but reckons the national team must consider going on the road. 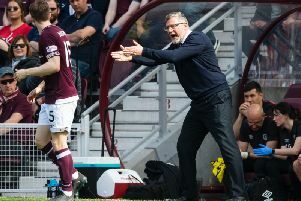 The Hearts frontman helped Alex McLeish’s side get off to a winning start in their inaugural Nations League campaign. However, there were just 17,455 fans at Hampden to see him force an own goal before nodding home the second as the Scots claimed a 2-0 win over Albania. A combination of the Monday night scheduling, £30-a-head ticket prices and the sense of malaise produced by Friday night’s 4-0 hammering from Belgium proved to be a turn-off for the Tartan Army. The sight of a half-empty Hampden will have alarmed those campaign for the Scottish Football Association to retain the national team’s historic home ahead of this week’s decision on whether to make Murrayfield the new home of both rugby and football. Naismith hopes the governing body rejects the lure of the 67,000-capacity Edinburgh arena - but he also believes Scotland will be damaging their own prospects if they do not consider moving some fixtures elsewhere. “If it’s a straight shoot then I’d say stay at Hampden - but it does need to be looked at,” said Naismith. “Tonight is a prime example. “These kind of games would be better suited at other club grounds that are not as big but have a much better atmosphere. “There’s definitely a difference (when the crowd is not as big). When I played here against Spain and Holland and it’s a full crowd, it’s a fantastic stadium to play your football in. “But when it’s a Monday night and there is 20-odd thousand there, it’s a different game altogether. “We knew it would be like that so we worked together and we created the tempo ourselves. “You do need to congratulate the people who did come as it’s a tough day of the week to come but we could gain a bit more advantage if we had a smaller stadium that has a much better atmosphere. Naismith was a late call-up last Monday but did enough in training over the weekend to persuade McLeish to give him the nod over Celtic hitman Leigh Griffiths. The move looked to have backfired when he hit the post with a header from point-blank range before squandering another chance by wandering offside just before half-time. But he made amends at the start of the second period as he forced Berat Xhimshiti to head into his own net. While the 31-year-old was disappointed to see that strike credited as an own goal he did get the satisfaction of getting his name on the score sheet for real on 68 minutes and he netted with an instinctive header. “I was claiming the second until I came off the park and they told me I’m not getting it,” sighed the former Rangers and Everton forward. “But to be honest I’m just glad to be back involved. I’ve taken my chances when they have come along. “I’m not going to rest on my laurels. When I got the chance to come back in I was delighted to do it.